Last week’s Green Grass of Home race provided a hugely entertaining finish for bewildered border runners. A popular mid-week race, the Green Grass keeps everyone on their toes (with consequent aching calves) by changing the route every year. This year was a tough one. Hardened fell runners and experienced mountain folk that we are meant that few had bothered to memorise the map beforehand, preferring the normally reliable strategy of “it’ll all work out somehow”, with a small side order of “there’s always someone to follow”, for those of us accustomed to the more sedate end of the field. Thus we set off. There was some climbing, some more climbing, a bit of traversing (some friendly marshalling from stalwarts Joe and Mario), a bit of descending, a bit of godawful flogging through featureless gorse, bracken and tussocky grass. Even the sheep had more sense than to provide us with a trod to follow here. The blessed relief of the end of this section saw more open ground and wishful thinking led to many runners seeing what they wanted to see and following a path leading gently over the brow and hence down to the finish. Those of a more pessimistic nature glanced up the steep and unpleasant hillside to see the telltale sign of a flash of marker tape. We accepted our fate and turned up the climb. We climbed and climbed some more. Eventually there was a narrow singletrack path leading almost levelly up and across the hill. Away from the finish. We were almost too tired to run on level ground here. Eventually we found Joe. Again. Nice that someone from the club was enjoying himself. More climbing. More pathless featureless difficult ground. Then a descent. A steep one at that, lots of ankle snaffling vegetation to worry about, or not, depending on your descending prowess. Eventually we popped out on the stony track we’d left some 45 minutes earlier on the ascent and a fast drop to the finish. Where we found the slack group looking remarkably fresh having been back for some time. The realisation began to hit as it became clear what had happened. Most people were remarkably relaxed about the confusion, I only heard a couple of cross voices. Everyone had a nice run after all. Just some people chose to cut the race a bit shorter. Martin took the sage decision to swiftly reclassify the race into ‘short’ and ‘long’ versions, generously giving two sets of his always-amusing prizes. The moral of the story is to never, never underestimate the hills. They can be cruel and unforgiving. Always be prepared for the worst and follow someone who know where they are going. Results and pics on the wfra site. 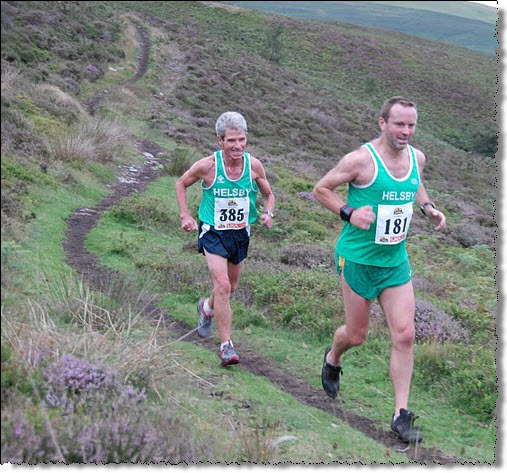 Thanks to Al Tye for the pic of Phil and Alec above and for Martin Cortvriend for taking it all on the chin. This entry was posted in Uncategorized and tagged fell, Green Green Grass, Hill wisdom, lost, moel famau, race, shortcut. Bookmark the permalink.